Arts & Crackers has been around since April 4, 2013, but I have blogged and reviewed products for several years on my previous blog Dealy Os. Read why I started blogging. Arts & Crackers works with brands! I work with companies to provide my readers with honest, high-quality reviews of products, services, and events. We are all about integrity here so I will share the good, the bad, and the ugly so my readers know they can trust my review and to provide companies with feedback they can improve with. While I am sure to share what I personally do and do not like about the products, I try to keep all of my reviews in a positive light. Want to be featured in a review, partner with me on a sponsored post, or run an ad on my site? Shoot me an email at [email protected]or Contact Me Here. Our posts are very high quality and I put a lot of time and effort into crafting each one. My posts are unique and original…I go above and beyond seeking to be set apart from other bloggers. Occasionally I will use free stock images and edit them to fit a post, but most all of the pictures I use on my website are exclusive high quality photos taken by me just for the post. Posts, especially sponsored, will be continually promoted after the promotion time is up, so exposure to your company will continue. It’s just me over here right now (with the help of some close family members and friends who double-check my work for me), so you know what you’re getting! I also have a great ratio of sponsored to non-sponsored content on my site. I am always coming up with new ideas and love the inspiration from brands we love. Look for this button on the menu bar; it represents my newest venture–an online store with some of my awesome products! Here is a quick, shortened printable version of my media kit! Click the picture to print for your reference. Full version below the graphic! Numbers certainly aren’t everything–“quality over quantity” goes a long, long way–but sometimes you just need to know the numbers. I love the craft projects and recipes I find on Arts & Crackers! It is definitely one of my favorite sites to go to. 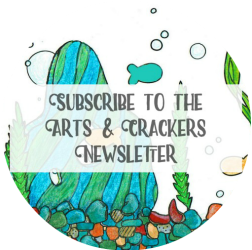 I love Arts Crackers because of all the awesome and honest reviews, plus there are awesome giveaways, DIY projects and more! I find your blog very informative. I appreciate that you don’t just share the positive regarding products, but also tell us the negatives. To me, that means we can trust your opinion. I love Arts and Crackers, I read her posts daily! She gives honest product reviews and her giveaways are the best!! I also enjoy her topic related posts such as teaching kids colors in creative ways and the yummy Cinnamon Hot Chocolate recipe she shared. I am just starting this section! If you are a brand I have previously worked with and would love to share feedback, please send me an email! Love Arts & Crackers? Feel free to leave your own review in the comment section! Thanks for visiting!